Experimenting making Japanese takoyaki with red bean filling. Wanted a lighter version than straight pancake batter so added 1 egg whipped egg white. For 9 takoyaki (one pan): 1/2 cup of Krusteaz pancake mix (+ 3/8 cup of water) combined with 1 egg white whipped to soft peaks. Pour half the mixture into an ebelskiver pan over medium heat (350 degrees f), add red bean mixture, pour other half of mixture, flip. Because of the two half additions of batter, the results looked like rounded dorayaki. 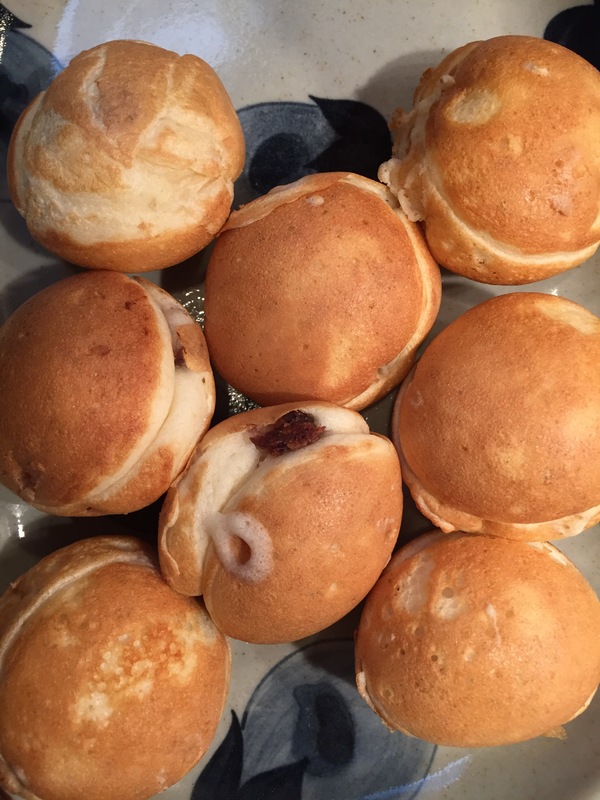 Next time, I’ll use the traditional takoyaki and ebelskiver technique to make a round seamless ball. This entry was posted in Desserts on February 27, 2017 by admin. 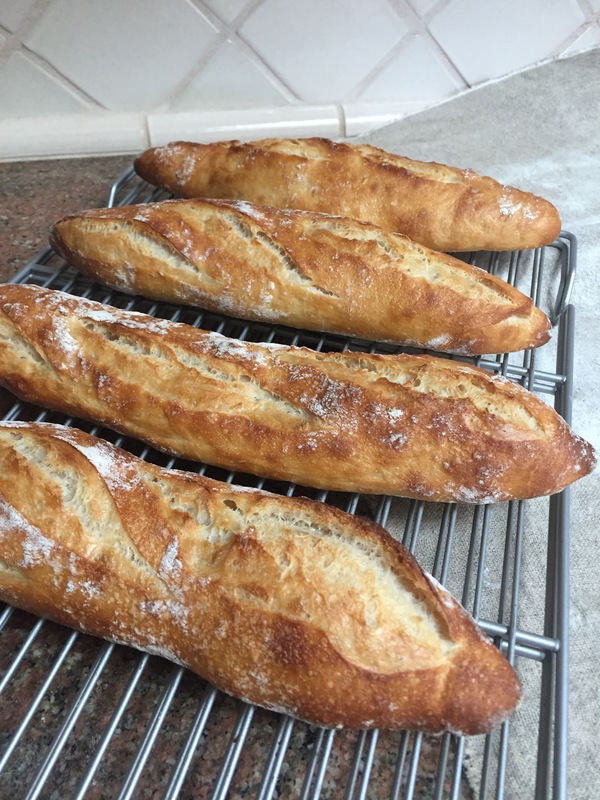 70% hydration sourdough baguettes with cold bulk fermentation overnight in the refrigerator. 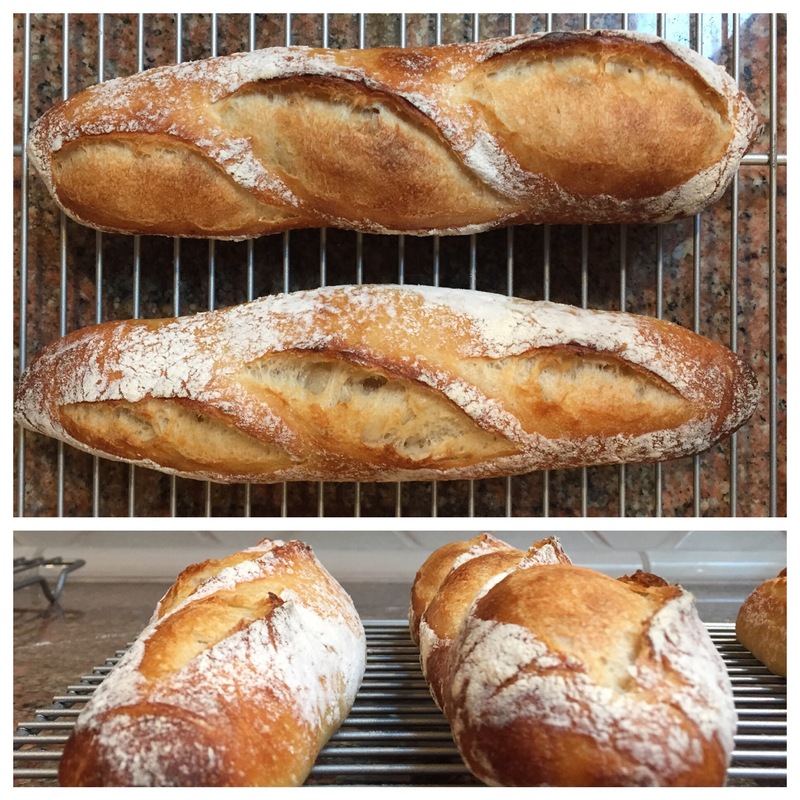 Strong oven spring showed weakness in my shaping. This entry was posted in Bread on February 25, 2017 by admin. 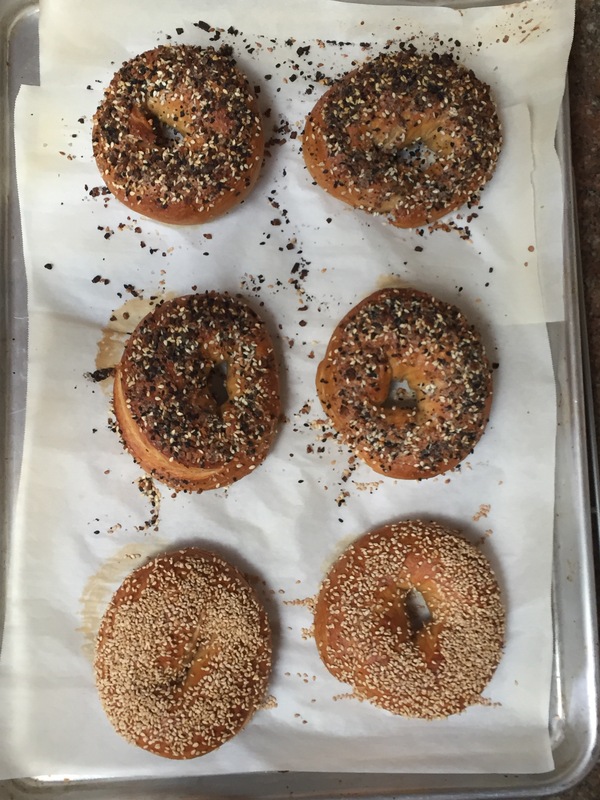 With Google Express delivering barley malt from Whole Foods yesterday, information pills bagel tests continue. While this batch is slightly over baked at 22 min and 400 degrees F, progress is being made. Formula is 55% hydration, 5% barley malt, 2% salt and 1.25% instant yeast. Cold ferment for bulk overnight in the refrigerator. One hour final proof, boil in baked baking soda water solution for 30 seconds each side, and in the oven. This entry was posted in Bread on February 24, 2017 by admin. Little girl woke up at 6:30am requesting cookies. So we made chewey chocolate chip cookies. This entry was posted in Desserts on February 23, 2017 by admin. Gasp! Bread that’s not gorgeous?!? What am I posting? How can I show people that I am an amazing/perfect baker?!? Life is about recovery and learning from failure. This bake just got away from me. 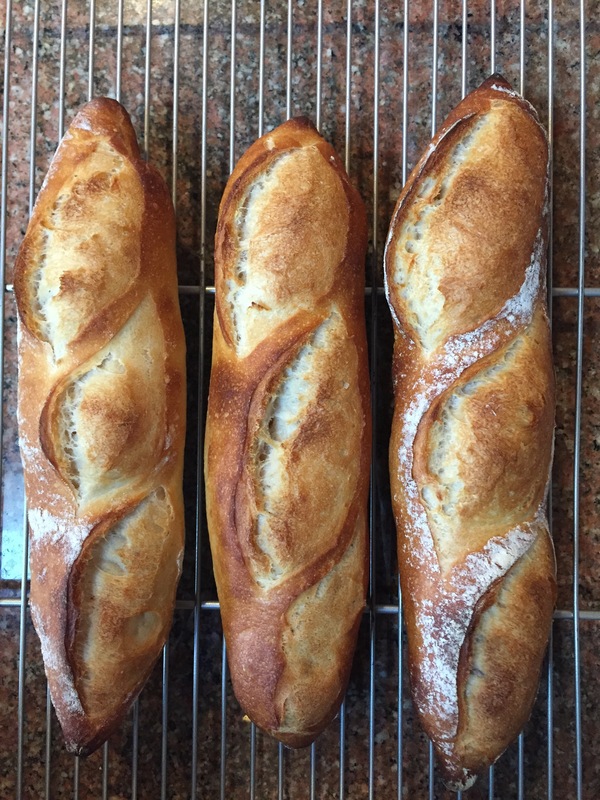 A 75% hydration is fraught with potential failure points, and I hit them pretty well. The final proof was too long (was distracted with a more pressing activity) and then the dough stuck to the couche. 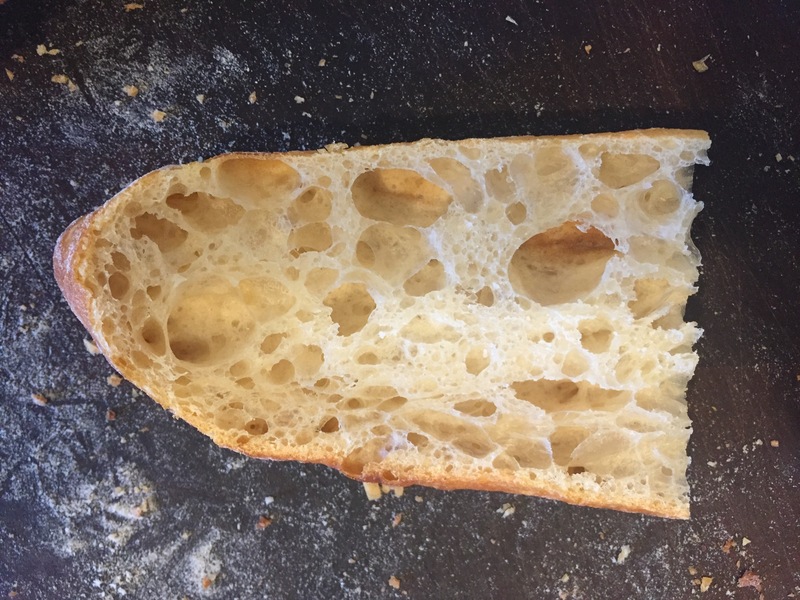 The crumb is at least decent. This entry was posted in Bread on February 22, 2017 by admin. 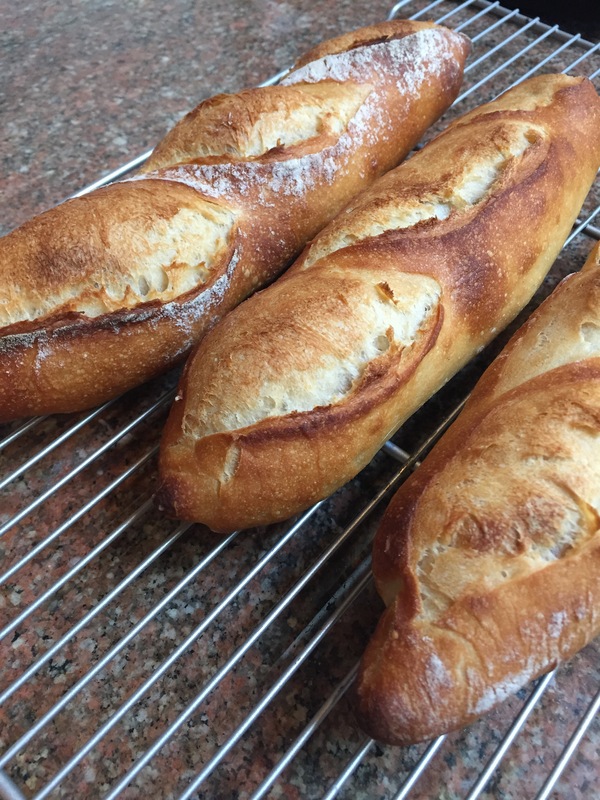 Been attempting an original recipe for Vietnamese baguettes. 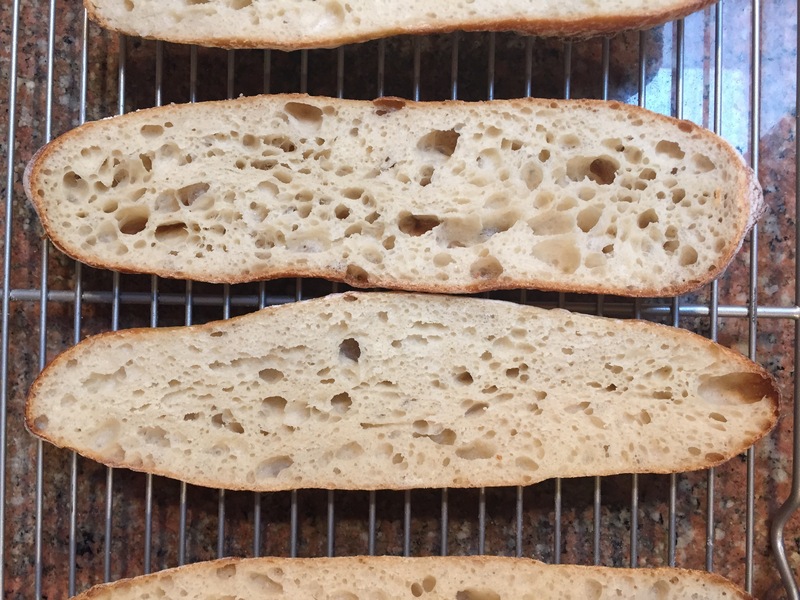 One of the “Perfect Sourdough” FB members shared a high hydration high protein recipe and I converted it to sourdough and used 5% brown rice flour to hopefully yield a crisper crust. The member also noted that she did not have a baking stone, but baked on an aluminum sheet pan. I did a comparison bake for her, keeping everything thing else constant. With a higher thermal mass and better heat transfer, the baking stone produced an almost 50% increase in volume and a more open crumb structure. This entry was posted in Bread on February 20, 2017 by admin. The family has been watching the Kid’s Baking Championship and the little one has the volcano cake challenge on repeat. Of course we needed to make our own. But first we needed a base recipe for a chocolate mini bundt cake. Scouring my many cookbooks produced a whopping zero recipes! 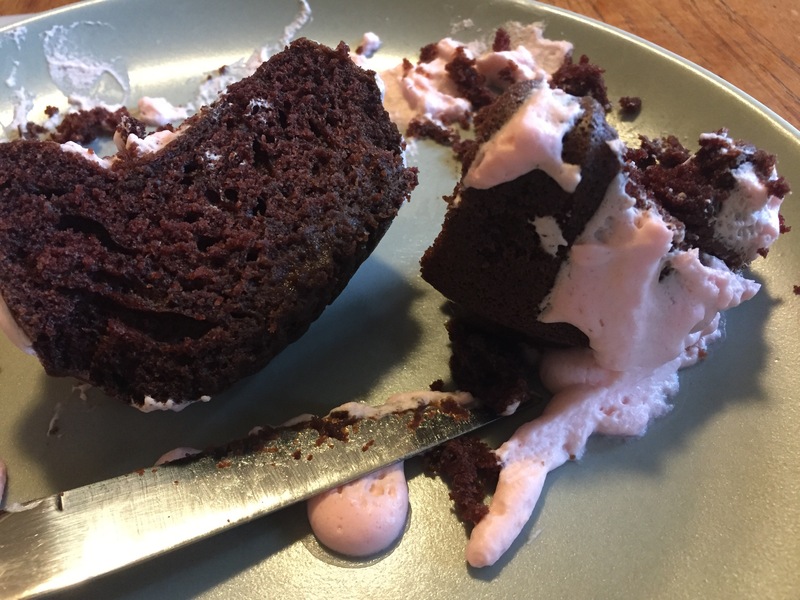 One of the cake recipes could have been adapted, but with no knowledge of bundt cake baking dynamics, it wasn’t worth the risk. As such, the Internet it is. My fast, easy and yet moist baking requirement was met with Two Peas & Their Pod chocolate bundt cake recipe, as it included sour cream. Next time, 1/2 the batter will be made. The recipe yielded enough for 12 mini bundt cakes. Which I presume is a regular bundt cake size. I do dislike american measurements, difficult to scale appropriately. 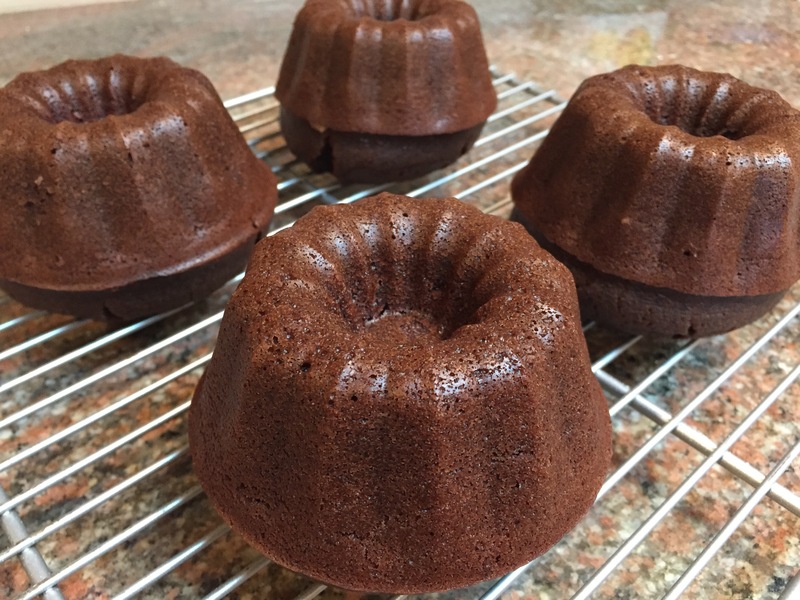 Here is an adapted recipe, for a 6 mini bundt cake pan. Note that I use significantly less sugar but increase the cocoa powder ratio. This entry was posted in Desserts on February 20, 2017 by admin. 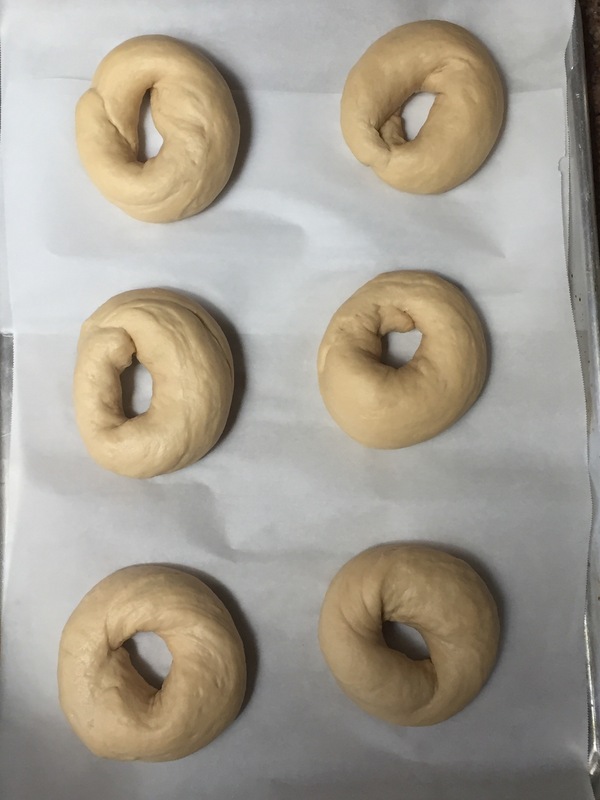 One of the benefits of a cold house is that laminating dough is easier. 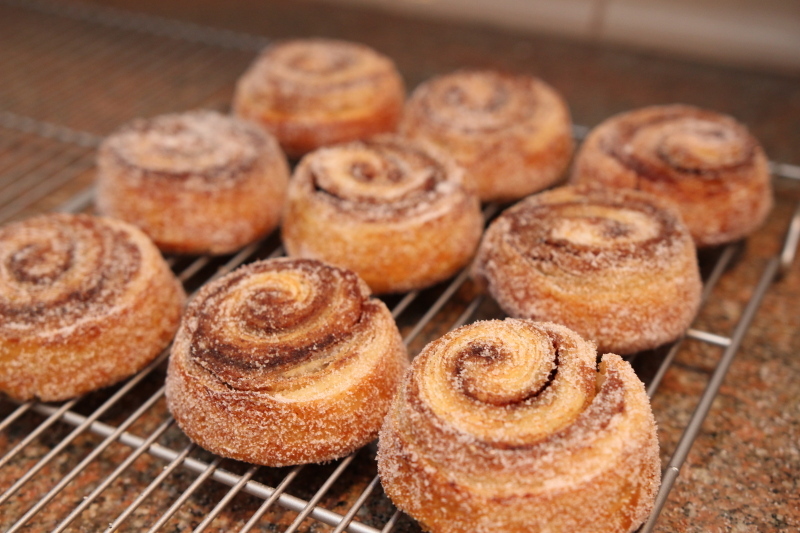 Got a request for morning buns, and I haven’t had an opportunity to make some in the new house. 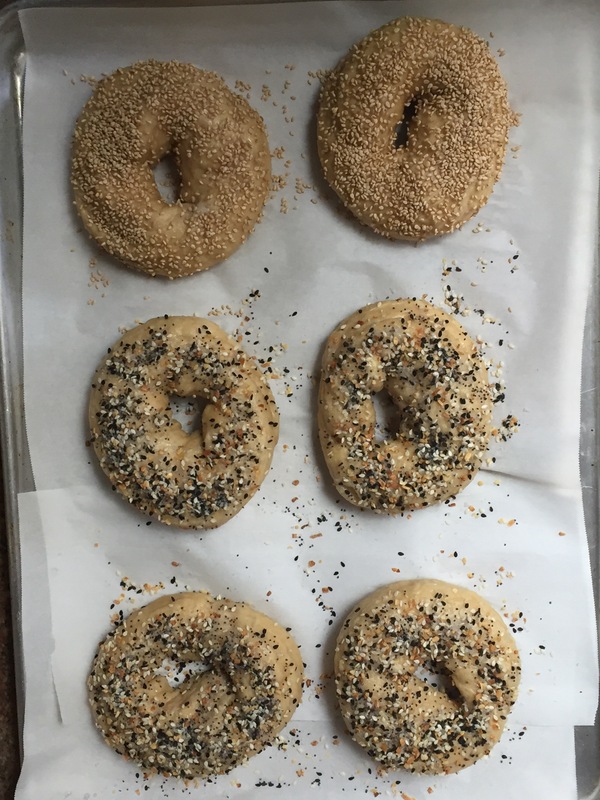 This batch used Peter Reinhart’s all purpose sweet dough recipe in “Artisan Bread Every Day.” The dough was prepared the night before, and the morning buns assembled the morning off. However, given the rise time requirement, it was more of a lunch bun treat. The bake was at 375 degrees for 20 minutes. 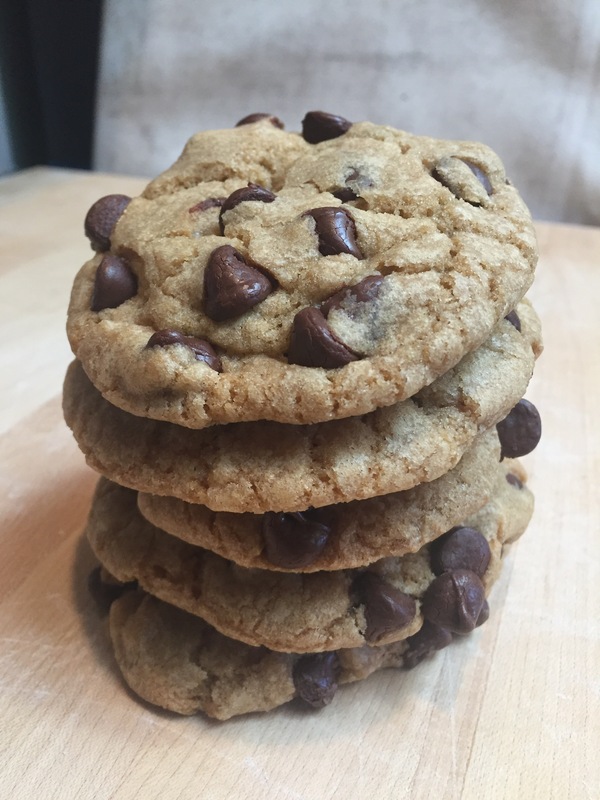 This entry was posted in Desserts on December 28, 2015 by admin. 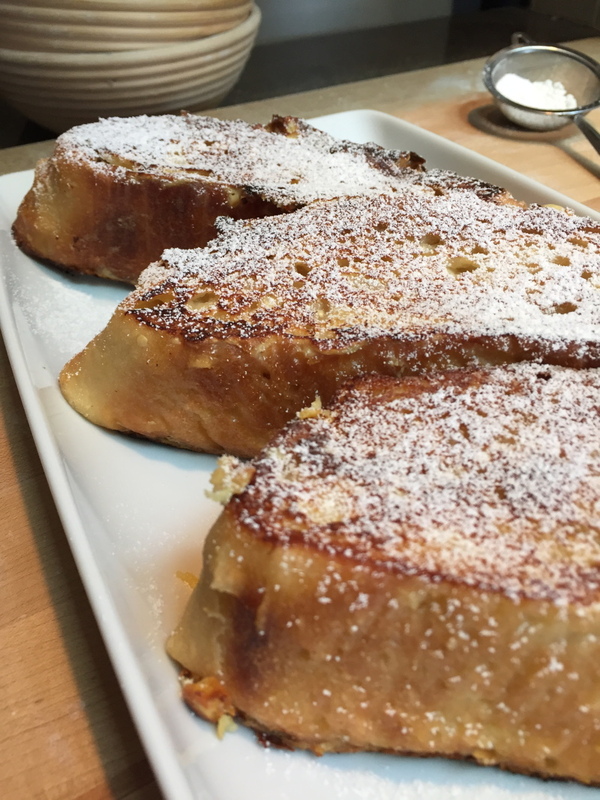 Christmas morning requires a special breakfast, and breakfast treat for me is pan perdu. While I did bake a day before so I had some boules to sacrifice, I don’t routinely stock the fridge with cream. As such, we were forced with a low fat, milk version. Not as decadent, but surprisingly good. Since I didn’t go into work on Thursday, I had a box of Stan’s Glazed Donuts at my disposal. Since there was no way I was going to throw them away, I knew it was time to let necessity take action. 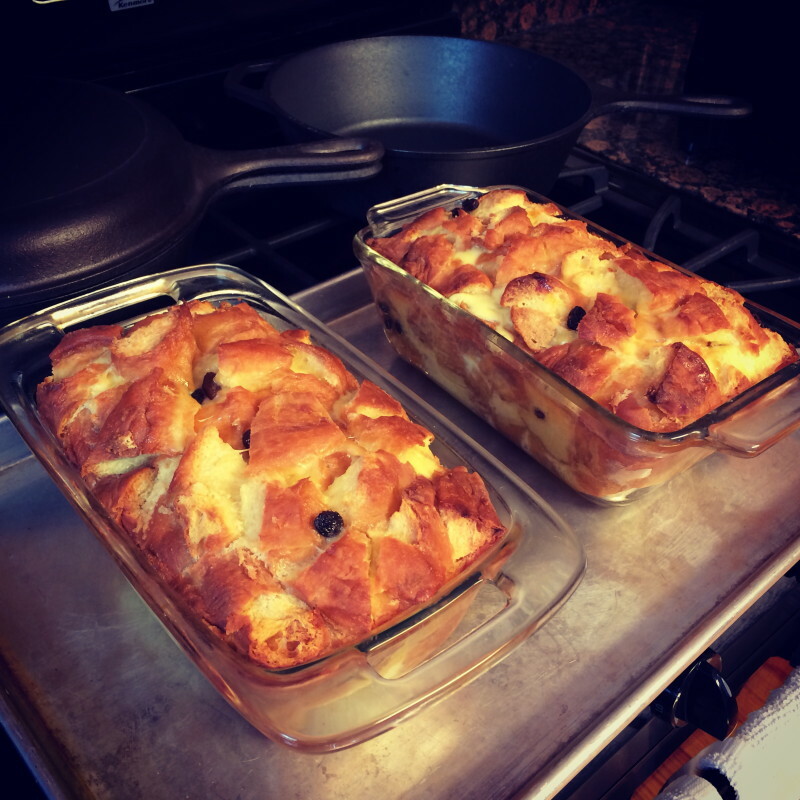 The best donuts in California will beget the best bread pudding, right? Combine heavy cream, sugar, salt, and eggs and mix thoroughly with a wisk. Pour mixture over cubed donuts. Cover and refrigerate overnight. Bake for 1:15 – 1:30 until knife comes out clean. Serve with powdered sugar and maple syrup (or condensed milk if you’re going Thai style). This entry was posted in Desserts on March 10, 2014 by admin.